Since 1991 Triazzle has brought joy to millions of enthusiasts around the world. From grade school children to college graduates it offers a seemingly simple challenge . . . can you assemble the triangles with all pictures matching? Its Harder Than It Looks! As an artist and designer I invented Triazzle to be as much a visual delight as a mental conundrum. Now, for the first time I am introducing an all-new line made in the USA from durable, recycled materials and printed with vegetable-based inks. Enjoy! Triazzle endeavors to support the educational community, our teachers and students. Educators may purchase Triazzle at discounted rates if you meet the minimum order requirement of 16 puzzles and can submit your tax-exempt document. Please contact us at orders[at]triazzle.com to place your order or for more information. 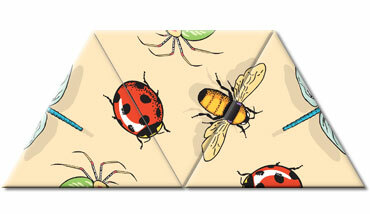 The object is simply to place the triangular pieces into the frame with all pictures matching. There are many possibilities where to place the triangles but only one will lead to the correct solution. Triazzle challenges strategic thinking, memory and even willingness to risk. Variations of the brain teaser have been made for all ages. Triazzle has won numerous awards including Dr. Toy's Best Classic Toys, Oppenheimer Toy Portfolio, Newsweek Editors Choice Award, iLounge Top 100 iPhone Games and many more. Stunning imagery has, from it's inception been a hallmark of the Triazzle series. 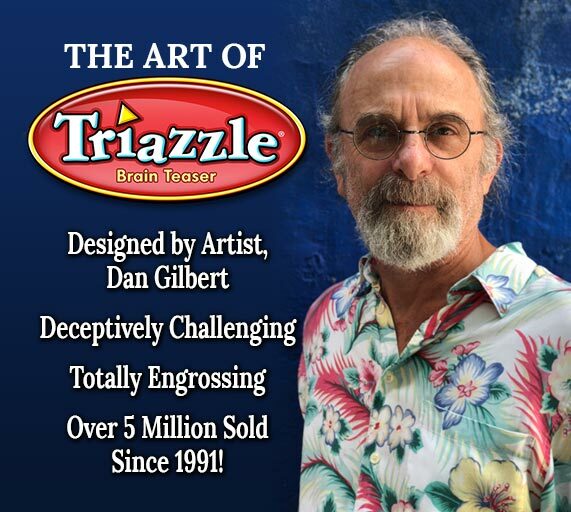 Since 1991, artwork for Triazzle has been created by Dan Gilbert and by illustrators at the "Art Group". 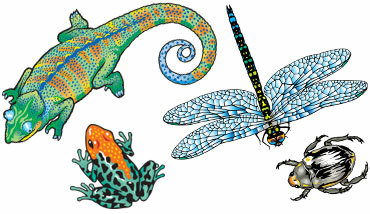 Most have been nature themes including all manner of insects, sealife, reptiles and amphibians, icky animals, tropical birds, the Solar System and much more. Triazzle has also featured licensed art including Pixar's Toy Story, The Simpsons, Disney's Alice in Wonderland, Finding Nemo, Peter Pan, Marvin the Martian and Star Trek. 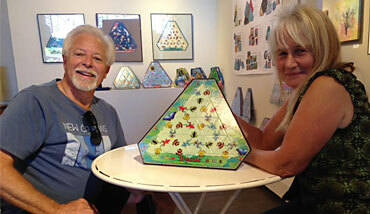 Triazzle is easy to play but difficult to solve and it attracts players of all ages. The same puzzles are enjoyed by children and grandparent, and are being used to teach statistics in a college classroom. They are a favorite activity for cooperative learning and the perfect pastime for students who have finished their assignments early. Once someone starts playing with a few pieces they cannot put it down. The new series features all unique solutions, so each puzzle is totally different.